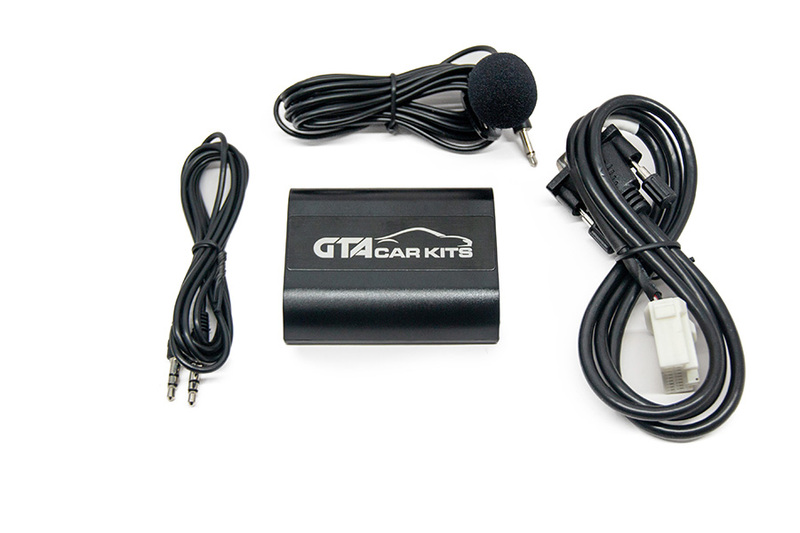 GTA Car Kit for Mazda RX-8 2004, 2005, 2006, 2007 and 2008 is all you need to integrate your smartphone, tablet or mp3 player with your stock car stereo system. We offer iPod/iPhone/iPad/AUX Wired kit with Bluetooth Extension port and Pure Bluetooth with AUX. Please refer to the table below to find detailed comparison between these two products. 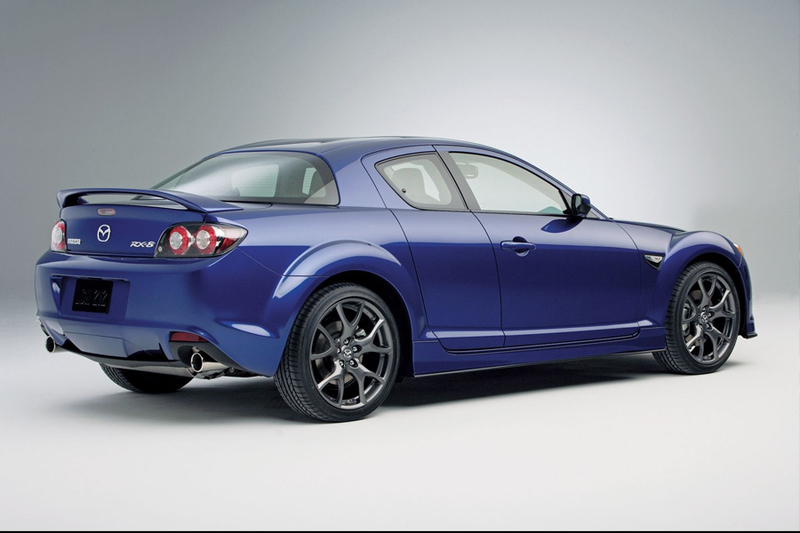 Our kit supports RX-8 stereo with software level 9.55 or higher only. In addition the stereo levels 9.81, 10.1 and 10.55 are not supported. To check the level please hold “Text” and “Disk 1” buttons at the same time while in the FM mode. GTA Car Kits is not responsible and should not be liable for any damages caused to you or your vehicle during installation of the kit. All installation videos on this website and GTA Car Kit's YouTube channel provided as a reference only. If you don't feel comfortable with DIY installation - please contact a car audio professional in your local area. Optional Bluetooth Extension (sold separately) allows to stream audio wirelessly. From car stereo controls or steering wheel (iPod/iPhone/iPad only). Note: wireless streaming through Bluetooth Extension does not support switching tracks via car stereo controls. From car stereo controls and/or steering wheel for Bluetooth paired devices including iPhone and Android phones. Supported. 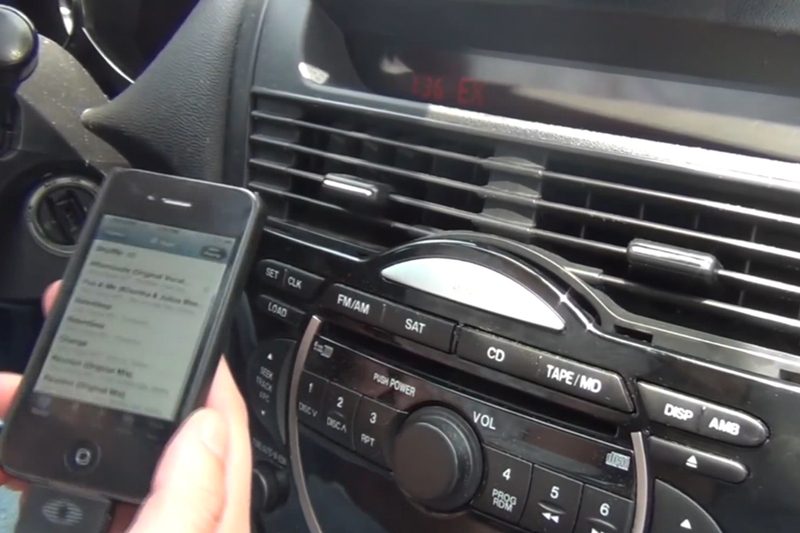 Receive calls and hang-up the phone via car stereo controls. Installation requires the removal of the stock radio and connecting the kit at the back via open external CD-changer port. Apple and AUX cables have to be wired outside. If installing Bluetooth Extension (sold separately) - microphone has to be wired as close to the driver's mouth as possible (preferably to A-pillar). AUX Cable and optional Charging Cable have to be wired outside. Microphone has to be wired as close to the driver's mouth as possible (preferably to A-pillar). - All iPods, iPhones and iPads are supported. So very excited right now. I did build in an android tablet inside my RX8 in place of the original navigation display. With your kit this change has become ultimate. Thanks a perfect instruction manual i did manage the montage in 30 minutes and it works like a charm. All the tablet sound is corretly sended to the Bose headunit in the car. Calling handsfree works like a charm too. That all by a bluetooth connection. I have used both kits(wired and bluetooth) and I must say, they work very well. I installed the bluetooth version in my Prelude and before that I used the wired connection in my dearly departed 3s. The kits both worked so well that I cannot wait to purchase a BT version for my RX8. They all give good crisp sound and work flawlessly. I recommend these things to all kinds of people. This kit did exactly what it was intended to do. The install took me about 45 minutes to do and was super easy. Honestly, the hardest part in my opinion was removing the bolt that holds the radio in. Aside from that, everything else was easy. The quality of sound is very high but I had trouble pairing it the first time around. I eventually got it to work and everything works perfect now. I would definitely purchase this kit for another car if need be and would recommend to anyone looking for a Bluetooth kit. Thanks for the awesome product guys! I just installed last night the Bluetooth kit to my 2005 RX8 Grand Touring Manual. First of all, let me give credit to the easy ordering process and quick shipping. And the product is packaged as described so there is no surprises. Second of all, thanks for the awesome installation instruction video, which is tremendously helpful. Without the video, I wouldn’t know how to take the stock console apart. I did lose the 10mm bolt behind the deck when I loosened it and dropped it, but that was my fault. Lastly, the product works as advertised and my 11 year old car is completely transformed and fully stepped into the new world of wireless connectifity. Music through Bluetooth from my Android device is loud, clear and crisp. It is better than CD quality with my untrained ears. And the added AUX input is great too if you have a passenger who also wants to share his/her content on his/her device. To me, the main attractiveness of this Bluetooth device is the fact that it is fully integrated with our stock head unit, so all factory controls including the ones on the steering wheel work perfectly. This is just not something that can be beat by any other after market options out there. I just wish I had found out about this little gem a few years earlier. looovveee my Bluetooth kit. It’s like a new car now. Out with the CD’s and radio. The kit took me 45 minutes to setup and was very simple. Sound quality is great. Such a good investment! 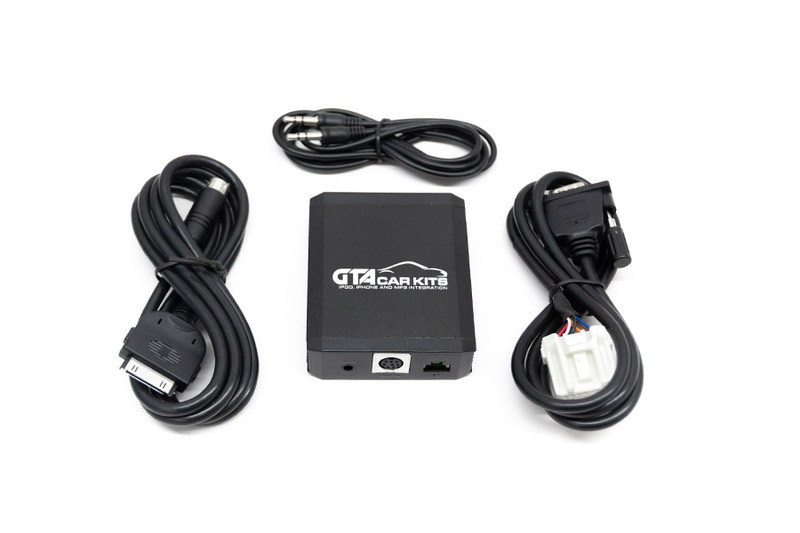 I bought and installed one of these for my 2005 RX 8 in 2013. It has been working flawlessly since then. This is an awesome device and does what it says it does. I can literally take a 7 day road trip and not hear the same song twice!! Not to mention having playlists and any song I want literally at my fingertips while driving. Never have to let go of the wheel either, which is a great safety feature too. Sounds awesome and my “special” driving play list , aptly named ” Road Music” is for when I’m cruising the New York City streets in the summer with the windows down, or when I’m “heading down the highway” at cruising speed! Not having to buy and install a customized $400 stereo just to use my pod is great, I hardly ever listen to the radio anymore. Nice job GTA! Went in like a charm (2006 Mazda RX-8). Version 9.82 software, just like in the video. That side bolt is hard to reach, man! I managed not to drop it, though. One note – you really do have to pull the radio well out of the bay so that you can see the connector; you can’t really see it very well from the bottom. Pull that baby out, tip it down, and look for it up higher. Fishing the wire into the glove box wasn’t too bad; I put the iPod and the little GTA black box in the glove box. No problems putting everything back together, and it works like a boss. No more talking head morning FM DJs for me! Thanks, GTA! Just installed mine yesterday. 2005 sutomatic rx8 with gps, bose system. It took me about an hour to do. The hardest part was getting all of the clips to come off of the back of the radio as they prevented me from pulling the head unit out any more than about 2 inches. I am very happy with the GTA car kit though. It works great and would recommend it to anyone. “I literally drove out to Vaughan to pick up my GTA Car Kit right after registering my 2005 RX-8 at the MTO. I installed it myself in about 30min. The kit works perfectly. This video was extremely helpful. He’s not joking when he says be careful not to drop the bolt in the back. Dropped mine while putting the radio back together and I’m pretty sure it vanished into a blackhole inside my dash. Put it back together without and it seems secure. “I was looking how to install a car stereo for Mazda rx-8 2006 and I came across a video for GTA car kits. Shipping was average, not fast or slow. I did the whole installation with only a screw driver,(It had one part where I needed a ratchet but the bolt was already loose so I took it out with my bare hands) but I guess other cars will be different. The video was 100% helpful, I appreciated that GTA car kits took out the time to make a demonstration video…other big name companies don’t even do that. i’m using my iPhone 4’s and I love the fact that I cold still use my steering wheel controls. I ran the aux and ipod cables under my stick shift and into my cup holders, it looked liked Mazda made it for GTA car kits lol because it’s well hidden and I have easy access to it. i like the playlist feature the most, that acts like a cd changer. I do like to comment how instead of burning a cd every other day to keep hearing fresh music that holds about 18 songs, I could install GTA car kits and have thousands of song and with great sound quality! Only negative side is that it’s not available for every car, which means I can’t refer to certain people or buy it as a gift for certain people if its not compatible to all brands and makes.